Keith Connorton has gone on trial charged with the killing of 29-year-old Graham McKeever in 2017. 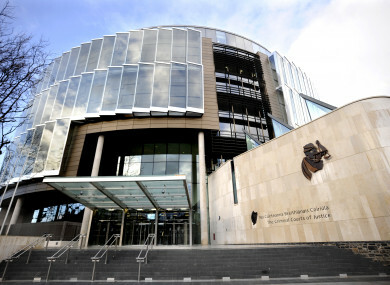 A 40 YEAR-OLD Dublin man has gone on trial, charged with the murder of another man who was in a relationship with his former partner. Keith Connorton is accused of stabbing Graham McKeever to death as the 29-year-old came to the aid of the accused’s former partner. Mr Connorton of Deerpark Avenue in Tallaght was arraigned before the Central Criminal Court today, charged with murdering the deceased at an apartment there on 18 February 2017. Dressed in a checked shirt, he stood and pleaded not guilty to the charge. A jury of nine men and three women was sworn in to hear the trial, and Brendan Grehan SC opened the case on behalf of the prosecution. He said that there was one other person present when Mr McKeever met his death: the mother of Mr Connorton’s child. The then 28-year-old Claire McGrath had been in a relationship with the accused for three years, and they had been living in that apartment on Deerpark Avenue. However, the prosecution claimed that she had effectively broken up with Mr Connorton about six months before this offence. This was because she believed that the accused was unable to kick his drug habit, and she began seeing the deceased. “So you are dealing with somewhat of a love triangle, if I can put it that way,” said Mr Grehan. “Mr McKeever was invited to stay over at her apartment on the night,” he explained. He said that the deceased was in bed there when, sometime before 4.30am, Ms McGrath heard a noise. “She got up to investigate and discovered Mr Connorton was in the apartment. It appears he had a key,” he continued. “The prosecution case is that Mr Connorton became aware that Mr McKeever was in the apartment and Ms McGrath was, in effect, being threatened by Mr Connorton, who had armed himself with a knife from the kitchen,” he said. The barrister also told the jury that the deceased had been stabbed a number of times, ‘significantly’, in the back. Mr Grehan also understood that the accused would be asserting self-defence. The trial continues tomorrow morning before Mr Justice Tony Hunt. Comments have been closed as the story relates to active legal proceedings. Email “40 year-old goes on trial over fatal stabbing of man in relationship with his ex-partner”. Feedback on “40 year-old goes on trial over fatal stabbing of man in relationship with his ex-partner”.